A 58-year-old man who never smoked and was under follow-up for polymyositis associated with fibrotic interstitial lung disease was found to have an incidental opacity in the right upper lobe on a chest radiograph. He had been treated with daily azathioprine 200 mg and prednisolone 10 mg for 15 years. 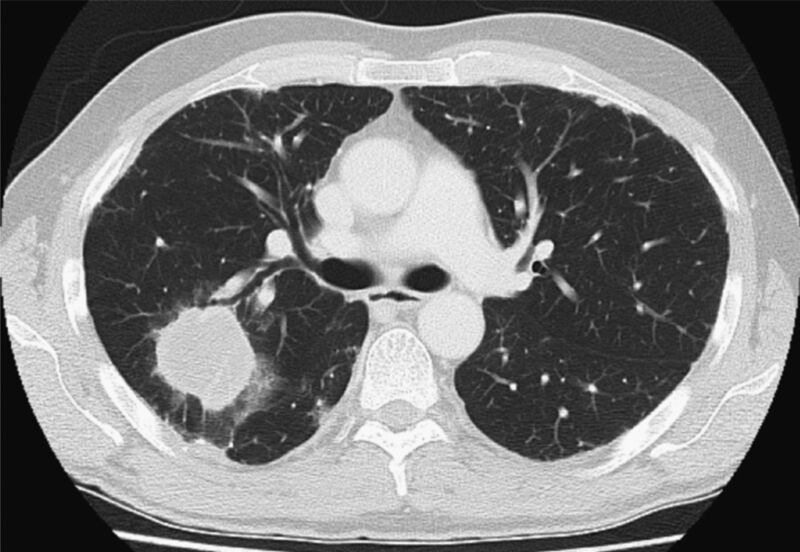 A CT chest revealed a mass-like lesion of relatively low attenuation suggesting necrosis (figure 1). Bronchoalveolar lavage was negative for microbiology and cytology. CT-guided biopsies were reported as showing necrosis and inflammation only. A month later, he developed cough with malodorous sputum, generalised fatigue, mild fevers, sweats and dyspnoea. Initial CT through the upper lobes showing an amorphous relatively low attenuation (near-fluid density) mass in the posterior segment of the right upper lobe. Sections through the lower lobes showed features consistent with non-specific interstitial pneumonia. Two months after the first CT, at presentation to our unit, the patient experienced small haemoptyses. Subsequent chest high resolution CT showed a marked increase in size of the lesion and eccentric cavitation (air crescent sign) (figure 2). Bronchoscopic lavage and endobronchial biopsies remained non-diagnostic. Multiple CT-guided cutting needle biopsies of the margin of the cavitating lesion were performed. Biopsied tissue was negative for Mycobacteria, Aspergillus, Nocardia and Actinomyces. Histology showed necrosis and established fibrosis with areas of dense lymphoid infiltrate within the alveolar interstitium, and abundant fibrinous debris within the alveolar spaces (figure 3A). Within the infiltrate, an atypical CD20 lymphoid population was identified (figure 3B), lying in a denser CD3 T cell population. Staining for Epstein Barr virus was positive. High resolution CT two months later showing a marked increase in size of the mass-like area of consolidation and the development of an ‘air crescent sign’. In addition, there were some new small foci of peripheral consolidation. (A) The biopsy shows necrosis and predominantly small lymphocytes and histiocytes. However, occasional atypical cells are also present (arrow), which (B) stain with CD20 ((A) H&E×400, (B) CD20×200). This figure is only reproduced in colour in the online version. Air crescent formation within a mass-like lesion is most commonly associated with aspergillosis, usually in immunocompromised patients1. However, this sign is occasionally seen in malignancy, vasculitis and lymphoproliferative disorders. The rapidity of progression was inconsistent with primary lung cancer and favoured an infective, lymphoproliferative or vasculitic process. The histological findings on biopsy led to a diagnosis of lymphomatoid granulomatosis (LG) grade 3. LG is graded as 1–3 based on the proportion of large B cells, with morphological overlap in grades 2 and 3 with large B-cell lymphoma.5 Treatment for higher grades is with combination chemotherapy. Our patient received R-CHOP (rituximab, cyclophosphamide, doxorubicin, vincristine, prednisone) with good clinical response. Key points illustrated by this case: (1) long-term immunosuppression should raise clinical suspicions for LG; (2) rapidity of disease progression can refine the differential diagnosis; (3) the air crescent sign is not specific to aspergillosis; (4) there can be sampling issues when needle biopsy is used, particularly for partially necrotic lesions.
. The air crescent sign. 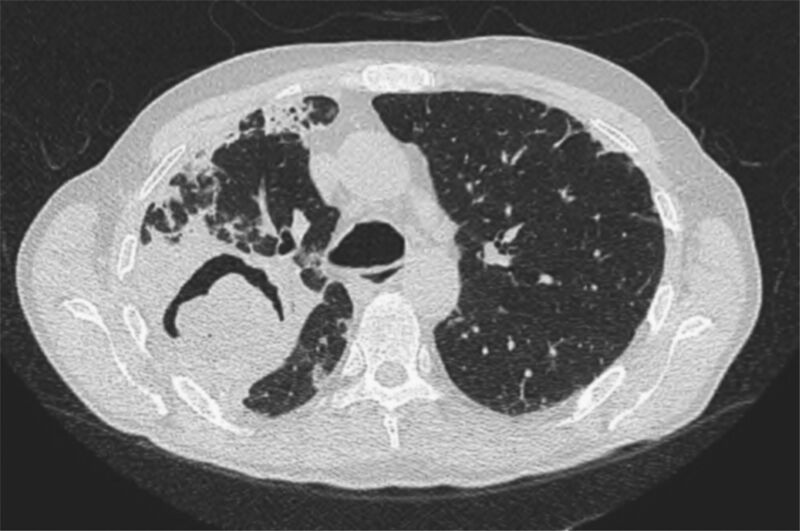 Radiology 2001;218:230–2.
. Lymphomatoid granulomatosis mimicking interstitial lung disease. Respirology 2008;13:1085–7.
. Lymphomatoid granulomatosis. Hum Pathol 1972;3:457–558.
. Current histological diagnosis of lymphomatoid granulomatosis. Mod Pathol 2012;25(Suppl 1):S39–42.
. Lymphomatoid granulomatosis: insights gained over 4 decades. Am J Surg Pathol 2010;34:e35–48. Contributors All authors contributed equally to this case report.